View of the old gatehouse at Garlinge Castle, near Margate in Kent. Confusingly, this is also known as Dandelion, Daundelyon or Dent De Lion Castle, after its builder John Dent de Lion. He fortified his manor here, because of the threat of a Flemish invasion after 1435, which encouraged a new wave of fortifications on the south east coast. It was later used for more disreputable purposes as a base for Dent de Lion's smuggling activities. 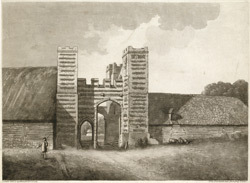 The print shows the gatehouse is square with four turrets (each with its own staircase). The gatehouse appears to have been built in alternate layers of brick and stone, creating a striking striped effect. In the 18th century the estate and castle was sold to Henry Fox, Lord Holland, and passed to his son Charles Fox. There were many alterations during the 18th century which made the castle more like a country house.